If you want to be strong, move well and prevent injuries, you need to be mobile in certain areas and have strength and stability in others. Neglecting the smaller muscle groups and stabilizers and/or not doing mobility work will only lead to trouble in the long run. Mobility is the one thing many people tend to slack on. When planning your workouts, you should take this into consideration by adding in some mobility exercises into your warm-up, or between exercises as fillers and also focus on strengthening the smaller muscle groups that tend to be weak and neglected. For most people, it’s hips and shoulders that need mobility and glutes, rear deltoids and rotator muscles that need to be strengthened. Here are five exercises that can be done on a daily basis, either in your warm-ups before lifting, or as a circuit on a rest day. These are not the most fun or exciting movements, but doing these simple exercises daily can make a big difference in the long run. This is a great dynamic movement for hip mobility. It stretches the hip flexors, hamstrings, and addductors (inner thigh muscles). Make sure you bring your foot up to the OUTSIDE of your arm and hold for a second in the top position, while reaching for the ceiling with the inside arm. Do 3 sets of 5-8 on each side. Most people also have weak glutes and tight hip flexors from sitting too much, and even if you don’t, doing some glute activation exercises throughout the day definitely won’t hurt you. Plus, having strong glutes can prevent back pain, and you also get the benefit of stretching the hip flexors at the same time. As you do these, make sure to keep you core tight, ribs down, don’t arch the lower back, and squeeze those glutes hard. Pause a second or two at the top position. Aim for 2-3 sets of 15 reps. You can also do single leg bridges or glute marches for more of a challenge. Sitting in a deep squat position is great for stretching the hips, glutes, hamstrings, and adductors. You can also add in a reach to improve thoracic(upper spine) mobility. Make sure to keep the chest up and heels down on the ground. You also want to try to push the knees apart with your elbows. If you can’t get into a deep squat position yet, you can hold on to something to help you. Hold in this position for 30-60 seconds, or even longer if you can! Most people spend too much time hunched over a computer screen or phone all day, which often leads to tight pecs and shoulders along with weak back and rear delt muscles. This can eventually lead to rounded shoulders, forward head posture, and the “hunchback” appearance. Doing pull-aparts with a band will strengthen your traps, rhomboids, and rear delts for strong, bullet-proof shoulders, which is important to prevent injures and improve posture. Make sure not to speed through these. Keep your ribs down and try to keep the shoulder blades protracted. Aim for 2-3 sets of 10-20 reps throughout the day. If you don’t have a band, wall slides are great for strengthening the lower and mid traps and improving scapular mobility, all of which keep the shoulders healthy. Make sure to keep the hands and forearms against the wall and keep the ribs locked down. Do 2-3 sets of 8-10. Prone Ts are another great exercise to do daily for the scapula stabilizers and rotator cuff muscles. Hold for 3 seconds at the top, and aim for 10-15 repetitions. These are great for people who sit hunched over at a desk all day, or for anyone with rounded shoulders. Poor thoracic(upper spine) mobility can lead to neck, back, and shoulder pain. Do 2 sets of 8-10 each side. Make sure the movement is only coming from the upper back, not the lower back! I eat a lot of protein. I usually get 20-30 grams at every meal and snack, and I eat 5-6 times a day, so that’s around 150-180 grams of protein. I probably don’t even need that much…but what can I say? I like protein! My protein sources consist of eggs, ground turkey or beef, chicken, and cottage cheese or Greek yogurt every day. You should be getting most of your protein from real food sources, and you do not NEED to use a protein powder. With that being said, for me personally, I really look forward to my yummy protein powder concoctions. They satisfy my sweet cravings and help me get in protein without eating more meat…because sometimes that gets old. I’m not about to eat chicken 2 or 3 times a day because that be cray cray. So that is why I love me some whey protein powder. Protein shakes are great-BUT-I rarely actually just drink my protein! I have this for breakfast every single day! It’s delicious. Cook the oats in water for 90 seconds. Stir in the peanut butter. Add the protein and stir until incorporated, adding more water a little at a time to reach desired consistency. Be careful with the water-you do NOT want to ruin it my making it too runny! You can also add in bananas or blueberries if your calories allow for it. So yummy! These are basically the same indgredients as the above protein oats, but they are just made a little differently and eaten cold, not warm. These are great for when you literally want something that is grab and go in the morning that involves no preparing or cooking. 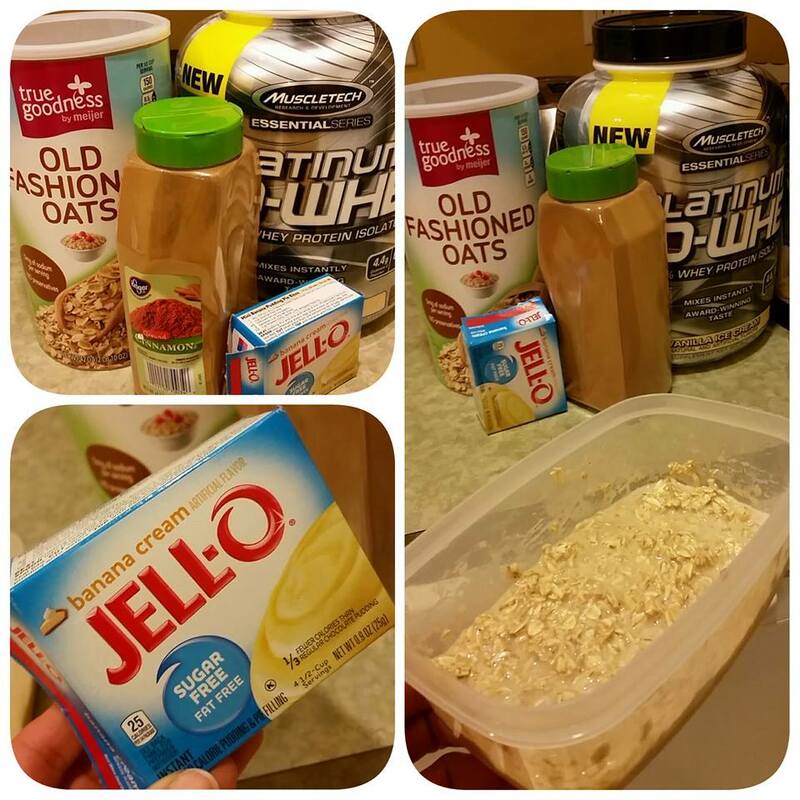 Combine the oats, protein, pudding, and peanut butter in a bowl or tupperware container. Add water a little at a time and mix until all ingredients are incorporated and it becomes a pudding-like consistency(make sure it’s not TOO watery!). Cover the container and put it in the fridge overnight. In the morning it’s ready to eat! 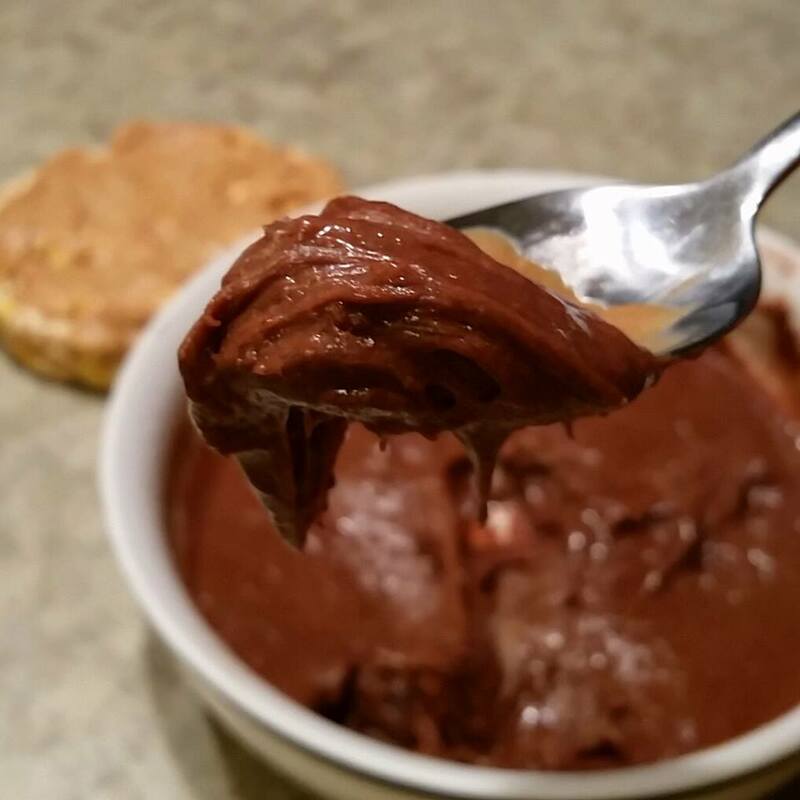 I have this as my bedtime snack on rest days, usually three times a week. It’s the best. thing. ever. Just don’t use casein protein because it will NOT have the same consistency. I use NitroTech Nighttime by MuscleTech, and it’s amazing. 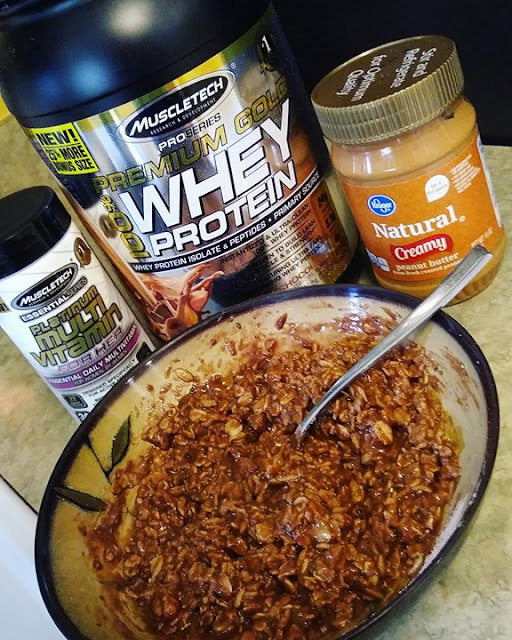 Put the scoop of protein in a bowl, add the peanut butter, and slowly add a little water until it becomes a pudding like consistency. Put in the fridge or freezer to thicken up. I like to put mine in the freezer for 20-30 minutes. It is the best EVER. I have mine with a caramel rice cake and MORE peanut butter on the side. Because peanut butter is life. 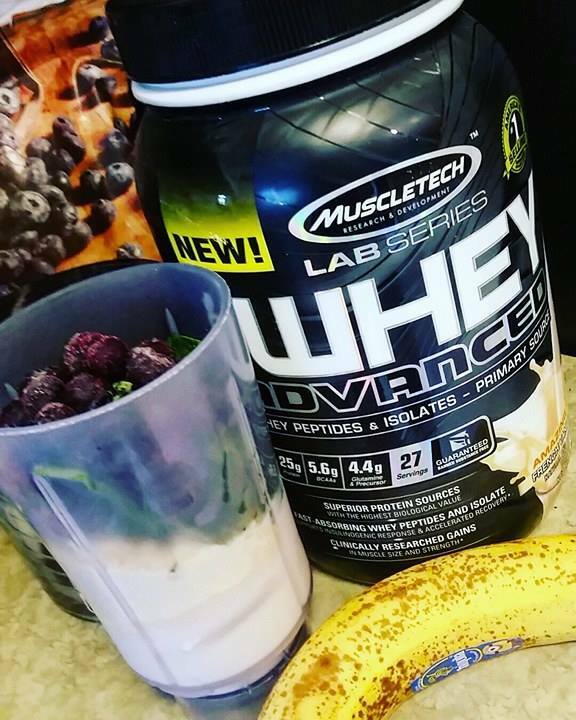 Smoothies are so refreshing after a workout, especially in the summertime! Blend all ingredients )I use a magic bullet) and pour into silicone muffin cups OR a popsicle mold. Freeze for at least 30 minutes. Enjoy your sweet treat! Fitness has been a part of my life since I was 13 years old when I picked up my first set of dumbbells. I fell in love with the weights, but nutrition wasn’t something that I started working on until I was about 18. I took some nutrition classes in college, and that was when I began to focus on eating healthier(no more McDonald’s and Skittles every day!). I ate pretty healthy from then on for the most part, but I didn’t restrict or watch calories or care about how many carbs I was eating. I didn’t know what the heck a macro even was! I was in a really good place with my food and my body image. I freely ate what I wanted to as long as it was healthy with absolutely no restrictions. I definitely just ate intuitively at that point, but I was becoming more conscious of trying to eat more protein and vegetables. I enjoyed working out and building muscle, but I felt good about my body and didn’t obsess over my abs(or lack thereof). I didn’t diet or restrict any food group at all at that point. But then one day I decided I wanted a 6 pack. Even though I had been working out for years and was never overweight, I was never lean enough in my midsection to have visible abs, so it was a goal that I thought would be really cool to achieve. And that was when the food obsession began. I really had no clue how to get a 6 pack or how to go about losing fat, so of course I consulted the place that has all the answers-the internet. More specifically, sites like bodybuilding.com.I began searching for how to eat to lose fat and get a 6 pack, and of course back then I was so ignorant of nutrition that I believed everything I read. That’s when the food restrictions began. I started eating only “clean” foods and cut back on carbs. There were certain rules I would follow, one being that I could only eat carbs early in the day but not at night. If foods had multiple ingredients, they were “bad” for me, and so I started fearing all these foods I used to eat but wasn’t “allowed” to anymore. I was constantly thinking about food and what I “could” or “couldn’t” have, or what was good or bad for me, and making sure that I didn’t eat too many carbs or whatnot for the day. All junk foods were eliminated except for a cheat meal on the weekend, where I would completely gorge myself with all the foods I restricted myself from during the week. Then someone introduced me to macros. I had never tracked my calories at all before, but I decided that I would start. I actually wanted to do this to make sure that I was eating ENOUGH, as my goal was to build muscle. Tracking macros was definitely eye opening for me and taught me a lot. It was actually really good in the sense that it helped me to be free of the strict “clean” eating mindset. I began to understand how you could really eat anything as long as you stayed within your macros, so I stopped fearing certain foods and food groups. At that point, I re-introduced many things that I had taken out of my diet previously and also increased my carbs, which I had been scared of for so long. I no longer felt guilt about eating anything. I started eating cereal for my post workout meal, and an oreo or two after dinner at night, and it was amazing! I realized that there are no foods that will make you fat as I had previously believed, which took away all the food guilt I had associated with certain things. It was so freeing. Eventually, however, it came to the point where I just didn’t want to be a slave to a food scale or logging into myfitness pal all the time to see what I could eat for the day. I realized that even tracking macros, as freeing as it was, could also become obsessive, and I just wanted to be free of all the stressing about food in any and all ways. I felt that not tracking was the way to full freedom from food obsession. It was a little scary to stop tracking at first, but since then I haven’t tracked at all, and it’s great. I have a good understanding of portions and calories and all that now, and I know how much I need to eat, so I really see no reason why I would ever need to track again. It was very helpful, but not a forever thing for me. During this time, my mindset about fitness and health and body image was changing. Or, I should say, God was changing my mindset. I began to see that fitness and food had consumed my life to the point where it was of more importance to me than my relationship with God. It’s not something that I did purposely, as is usually the case when our relationship with God gets pushed to the backburner, but it just happened. It was all I thought about and read about. I spent more time thinking about food and workouts and planning workouts and working out than I spent with God, reading and studying His Word. Since then, I’ve come to realize how the striving and chasing and obsessing over our bodies and food is really not what matters in life. When I’m consumed by these things, even things that are good like eating healthy and working out, I can’t fully commit myself to fulfilling God’s purposes for my life. When my mind is filled with these thoughts of food and workouts all the time, I’m not able to hear God’s voice. I now have a more eternal mindset, and I want my identity and fulfillment to be in God alone. I want to focus on the things that matter to Him-not waste my life nitpicking and obsessing over food and my body, wasting it on something that God doesn’t even look at(outer appearance)! I don’t want to be a slave to my body, to food, to working out, to anything. Having this mindset has made all the difference. I’m in a good place now with my nutrition and workouts. I’m not obsessive about it like I once was, because I realize that there are more important things in life to focus on, like helping others and spreading the Gospel and just enjoying life! One thing that really helped was no longer following most fitness competitors(as I’ve realized many of them have disordered eating and body image issues) or even health bloggers. I follow people now who promote balance, a healthy relationship with food, and a positive body image. I think it’s awesome that there are people out there promoting the message that you don’t have to HATE yourself or live in fear of food. My relationship with food has improved SO much over the years. I don’t fear carbs or processed foods, or any food for that matter. I really enjoy all my meals and am eating foods I love, not choking down foods I hate. I don’t feel like there’s any food I “can’t” eat. I don’t freak out if I can’t eat “on plan”. I can relax and not stress about food on vacations or when eating out at a restaurant. I don’t have to track every ounce of food I eat or worry about going over my fat or carb grams for the day. I don’t restrict or try to “work off” something I ate if I feel like I’ve overindulged. I try to get in my veggies and nutrients, but it’s not a source of stress or anxiety for me anymore. I know that as long as I’m not eating junk food all the time and I’m exercising consistently, that I don’t have to be perfect or stress about being healthy. I do the best I can, but I’m not gonna let the pursuit of health limit my quality of life like it used to. Just like with food, my body image has gotten better as well. I no longer take comparison pictures all the time or critique my body in the mirror. I can go a whole day without even thinking about how my body looks. Yeah, of course I still take mirror and flexing selfies, but now it’s out of a place of love and appreciation for my body, not to see what I need to “fix”. Those days are over! My hope is that if this is something you are struggling with, they can be over for you, too.